On our last full day in Paris we went to Versailles – completing Aileen’s wish list of things to do, and mine was already complete. We celebrated our last night in the apartment with a bottle of good French champagne and, er, pizzas. Well, we’re half class. It had to be something takeaway, and there’s a really good pizza place right next to the front door of our apartment block. The guy who makes the pizzas is from Bangladesh. Paris is certainly a multicultural world, though mostly African rather than Asian. Actually, I tell a lie because that wasn’t our last full day, though it should’ve been. We spent the morning packing at leisure – including the bit we’d dreaded. The divan bed when folded out had a tilt on one side, so we made a bigger bed facing the other way by folding out a chair that also converted into a bed. But the way it converted – we couldn’t make sense of it when we tried to turn it back into a chair on our second day. We thought we’d never fix it. But in the end, on the last day, worked it out after about half an hour. We had a final lunch, went to our local cafe for a final coffee, and said au revoir to our little apartment, au revoir to our local metro and supermarket. 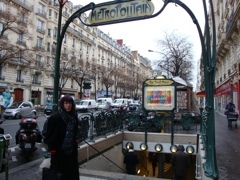 Here’s the wooden staircase going up to our apartment (OK, at the end of this write-up, I can’t make the image appear where I want) and our very-close-by metro station (ditto). We took a taxi to the airport – and the first thing we saw when we looked at the Departures board was that our KLM flight to Amsterdam was ‘annule’ – cancelled! I went to the KLM counter, and they explained we’d already been booked onto an Air France flight going to Hong Kong, followed by a Qantas flight to Sydney. So we didn’t avoid Qantas in the end after all! We had several hours to kill, because the new flight wasn’t due to depart till 11.40 p.m. And in fact we were still on the tarmac at midnight – hence our last full day. But it turned out better for us because we didn’t have the extra flight and airport stop at Amsterdam, and because our stop in Hong Kong iwas 2 hours instead of the 7 hours we’d have waited at Kuala Lumpur. So we ended up arriving in Sydney more than an hour earlier than the original flights. We came back to a perfect Australian day – sun shining, blue sky, blue sea (on train journey back to Wollongong). I now know how lucky we were, because when we left Wollongong for Paris, it was the start of a downpour here, and it didn’t stop raining until we came back. Now Paris is suffering the absence-of-Aileen-and-Richard effect – the temperature has dropped and looks set to continue around 7 degrees for days. It’s happened like this other times too. We ought to hire out our weather-enhancing powers! Meanwhile, here are a few more images from Montreuil, selected from all the ones Gilberte sent me, taken by the official photographer at the event. 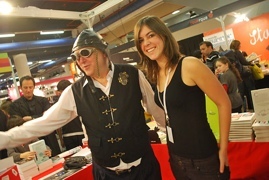 Me in steampunk gear, signing. Me and the lovely Bénédicte at the Hélium stall. 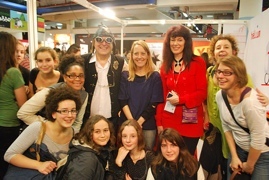 Gilberte standing between Aileen and me, Marie (who helped at the stall) to the left of me, some of the young readers from the Montreuil club at the front, and Valérie and Élodie (librarians and organizers of the club) on the far right. A little early morning blogging. Today’s the last day of the Salon de Montreuil, and I’ve got a couple of hours signing to do. Aileen’s already gone off to re-visit Rue Mouffetard, an open air market sort of street we fell in love with when we stayed close by last time in Paris. I think she plans to dawdle from patisserie to patisserie, cafe to cafe. She’s taken her spoon with her for getting back into the flat. To open the door, you turn the key through two locks, then a little bit extra to draw back the latch – and that last bit is very stiff. Aileen’s long fingers can’t manage it on their own, so we re-discovered the lever principle – she inserts the handle of the spoon through the hole in the part of the key you grip, then presses down on the spoon to turn the key. A triumph of human ingenuity! The sepulchres are all packed in close side by side, an enormous city of the dead. 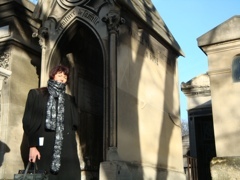 We started out looking for famous names, the sepulchre of Heloise and Abelard, and Moliere and La Fontaine. 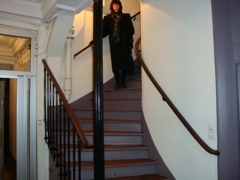 But after that it got more and more difficult – although we bumbled around looking for Oscar Wilde, Edith Piaf and many more, the only other one we actually found was Balzac, the French novelist. Meanwhile, it was growing colder and colder! It was a mostly sunny, but usually also means a cold day – my raincoat and padded jerkin weren’t enough to keep me warm. Earlier in the day was my last session of signing at the Hélium stall. I shall miss it. 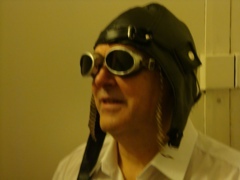 I signed quite a few copies after a slow start – but I was also the subject of a great many photos, in my aviator’s helmet and steampunk goggles. Then, saying goodbye to everyone at the end, well, it seemed very strange and a little sad to think that we wouldn’t all be meeting again the next day! But I think Sophie and Gilberte, Bénédicte and Hélène, Cécile and Elsa – I think they’ll all need a week to recover. I had the easy job! So sad – we can see the end of the Paris is it approaching, and we’re nowhere near ready to go! I put them on now and then when doing signings this afternoon, and for interview photo afterwards. Today we got rained on – not heavy bucketfuls of rain, Australia-style, but it lasted the whole morning, varying back and forth between drizzle and light shower. Aileen and I enjoyed the St Ouen flea market experience we went to another at Montreuil (not far from the Salon or Book Fair). Whereas Montreuil was more serious vintage and antiques oriented – and more expensive – Montreuil was mostly clothing, secondhand or cheap, a treasure trove of everything imaginable. We were selective only because we have to keep inside weight restrictions for the flight home. I bought apadded jerkin, Aileen ought an amazing skirt and a dozen other small items. Only problem was the rain – these were open-air stalls – plus the fact that my fold-up umbrella turned inside and then started coming loose from the prongs. It was only half an umbrella by the end. So we headed back to our apartment. I was on for two hours signing at the end of the afternoon, then had an interview with Nathan, a big fan of the juggernaut books, and his brother and friend. I really feel as if I have ‘fans’ in France more than any other country – young readers who don’t just like the books, or love the books, but who get right behind them and influence others to read them. It’s a great feeling to have that special level of support! 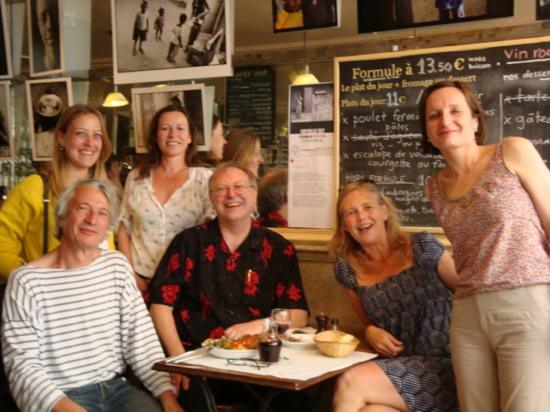 Here’s the team from Helium – a photo from when we had lunch on the Left Bank in 2010. It’ll be cold, the start of their winter, but who cares when it’s Paris?! I’m nearly about to reach the two thirds point in the next steampunk novel – then I can put my iPad aside (I type up on my iPad!) and start serious preparations. 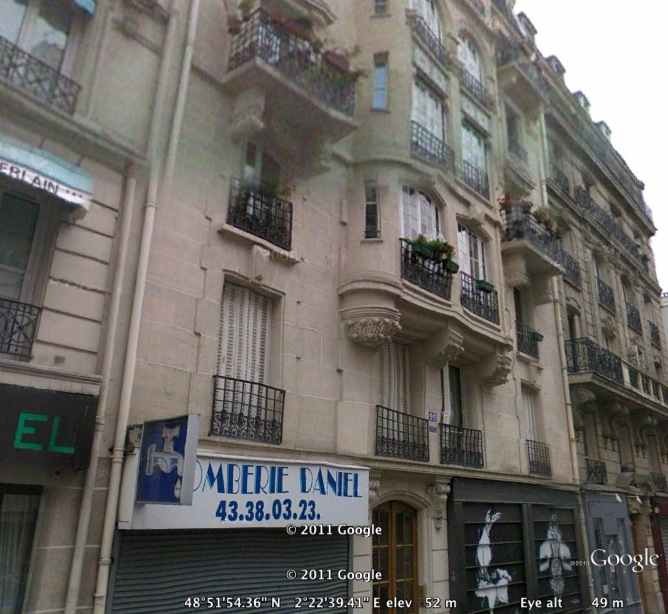 I checked out the apartment on Google – I’m still not sure of the actual building in Rue St Maur, but this is the view onto the street from where we’ll be. PS I’ll be taking Tansy’s MS with me to read on the iPad – the MS we’ll be critiquiing at the next ROR retreat. Good food, good wine, good reading!